Its name says it all. SAGA GIS stands for “System for Automated Geoscientific Analyses”. It’s no secret that SAGA GIS specializes in higher-level physical geoscientific applications. Its developers have put an incredible amount of time in building a robust free GIS software package. SAGA GIS was initiated by a small team of researchers from the Department of Physical Geography, Göttingen. SAGA GIS started out primarily for terrain analysis. It was originally meant for analyses like hillshading, watershed extraction and visibility analysis. Now, it’s grown into a bona-fide, full-blown GIS, open source GIS package. Although a rarity in open source GIS software, 3D viewing in SAGA GIS is incredible. 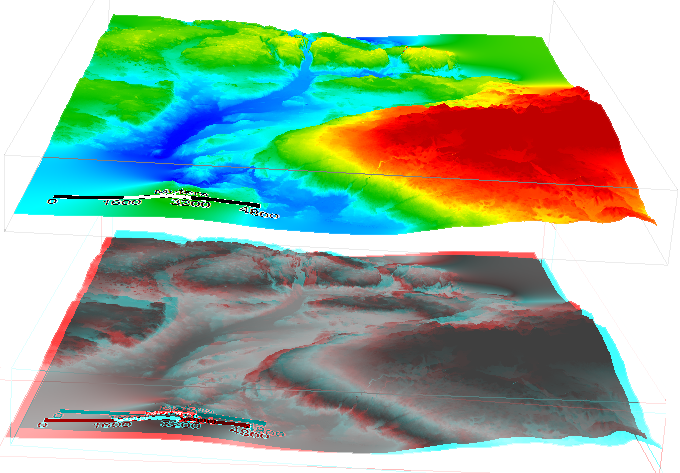 Add a Digital Elevation Model and enter the 3D view mode. Vertically exaggerate elevation and turn hills into mountains. SAGA GIS has preset color palettes to choose from. Go from a rainbow palette to the standard National Geographic topography palette. The rendering seemingly displays 3D data in a stunning way. If this wasn’t enough to get your taste buds going, the anaglyph tool will. Throw on a pair of 3D glasses like you’re at a movie. Visuals will pop out at you, as if you’re actually there. If you have point cloud data, SAGA GIS is equipped to consume it. Import your LiDAR LAS files, and do what you want with it. Elevations, light intensity, terrain heights – the LiDAR functionality is here and open source. SAGA GIS delivers a fast growing set of geoscientific methods to the geoscientific community. And the law of large numbers composed of the global scientific community demands statistics. The spatial and geostatistics tools in SAGA GIS are done right. Statisticians want to predict outcomes. This is where SAGA’s stat tools excel. It delivers regression techniques, semi-variograms and other prediction techniques. You can krig like you’ve never krigged before. The grid statistics are plentiful with Moran’s I, Principal Components Analysis and multi-band variation. The meridional and longitudinal grid statistics are unique tools in a GIS software package. It may be one-of-a-kind in SAGA GIS. Add this feather to SAGA’s hat. Geostatistics comes with surprising ease. Enable multiple windows to lay out all your analysis (map, histograms, scatter plots, attributes, etc). It provides both a user-friendly GUI and API. All you need is the screen real estate. SAGA GIS is a lifesaver in terrain analysis. It puts research-backed terrain analyses at your fingertips. With a couple of clicks, you can perform a vast array of uniquely developed tools made for geoscientists. Although a lot of data is required to run some of the modelling tools, they are pretty amazing. Simulate erosion, hydrological processes, lighting & visibility, slope stability, soil classification and the spread of fire. We like the morphometry tools. The SAGA topographic wetness index can be run with just a DEM. The tool will do all the work for you. We didn’t have much success with the topographic position index, but the TPI work related to Andrew Weiss is available for you. The point is: If you have a DEM, and don’t know what to do with it – you NEED to look at SAGA GIS. SAGA GIS is not particularly useful in cartography. It’s not. Don’t expect the polished symbology choices, color palettes, shadow text, label positioning and cartographic dreamy elements from QGIS. You will get a north arrow, a print layout view, scale bar and graticules. Nothing more. Nothing less. We’re not saying to avoid SAGA GIS for your cartographic purposes. With a bit of work, you can probably pull off a couple of neat looking maps – 3D maps for sure. The map-making factories known as ArcGIS data driven pages or QGIS Atlas don’t exist – as they rarely do with open source. But I don’t really think SAGA GIS was ever going to be the cartography Goliath that you get from QGIS or ArcMap. You’re probably better off looking elsewhere. Geoscientists around the world need to download SAGA GIS. Overall, it’s quick, reliable and easy to use. Consider SAGA GIS a prime choice for environmental modeling and other applications. It has over 300 modules – easy to learn in a slick, user-friendly GUI. The tabbed tools, data and maps table of contents save screen real estate. 99% of the tools are smooth and work well. The team of SAGA GIS developers have built a robust and free GIS software package for the world to experiment. In the niche of geoscientifc data production, SAGA GIS is a hat-back winner. 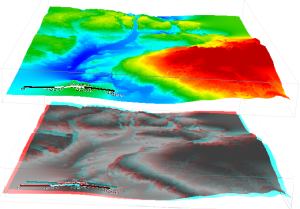 Moreover, modules climate – simulation – terrain analysis are very assistance. Saga GIS become one of gis softwares that is very rare recently.. This softwares offers so many things to do just by click several times and it can give the results very nicely. The main problem with SAGA is lack of documentation. Some tools look very interesting but not even a sentence to say what they are supposed to do.